January 2019 ~ At the AKC Winter Classic dog show in Novi, Michigan, Taylor (Can Ch Southcreek’s Toast of the Town) wins best of winners and best of breed from the classes for his second 5 point major towards his American championship! 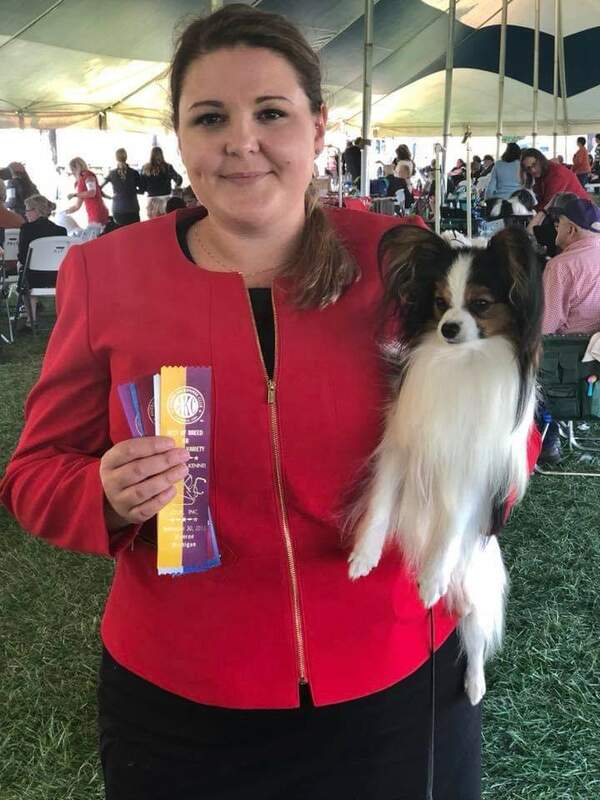 September 2018 ~ We are thrilled to report that Taylor wins best of winners and best of breed from the classes for a 5 point major at the Monroe Kennel Club show in Michigan! What an exciting win with a large entry of Papillons! September 2018 ~ At the St. Clair Kennel Club show in Michigan, Taylor, Can. Ch. 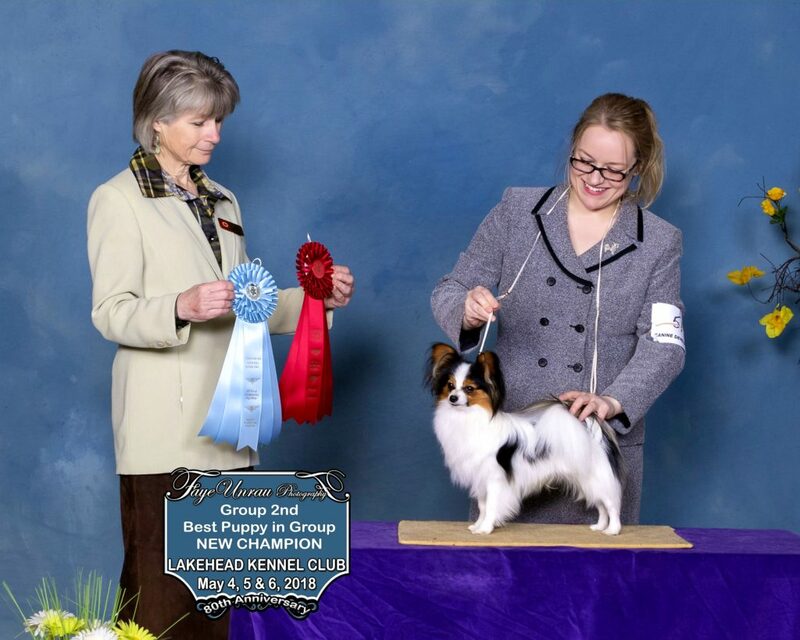 Southcreek’s Toast of the Town, is best of winners and owner handler group 2 both Saturday and Sunday at his first AKC show with new owners Lauren and Jo-Anne! September 2018 ~ At the TBK&TC dog show, Rosie gets her first points towards her championship, winning a group 3rd as well as 3 best puppy in groups! 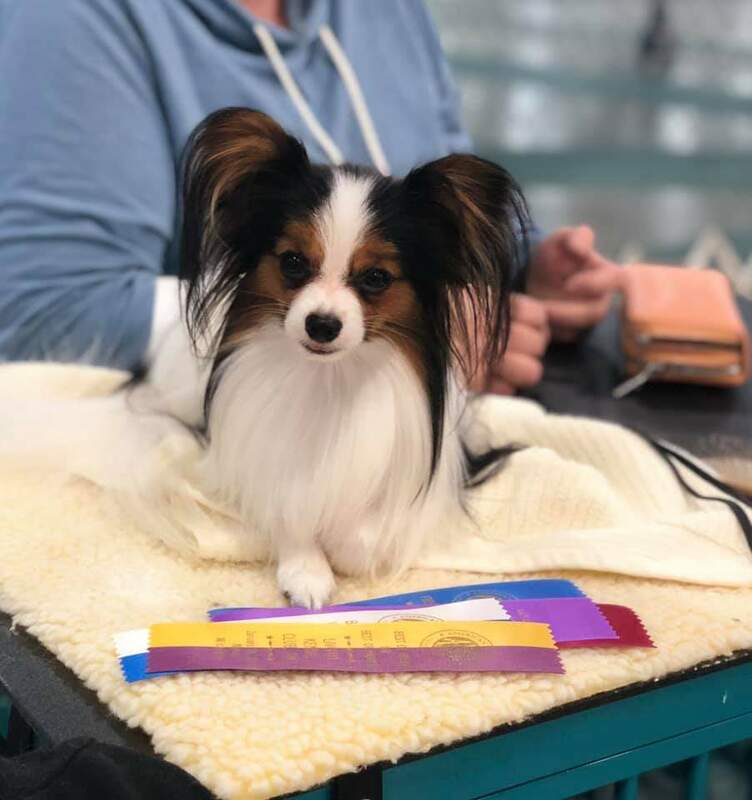 Our beautiful new import puppy from Brazil, Salatino Touche Pas Mon Cadeau (Zizi), has a wonderful time at his first show and wins a best baby puppy in show! June 2018 ~ Ch. 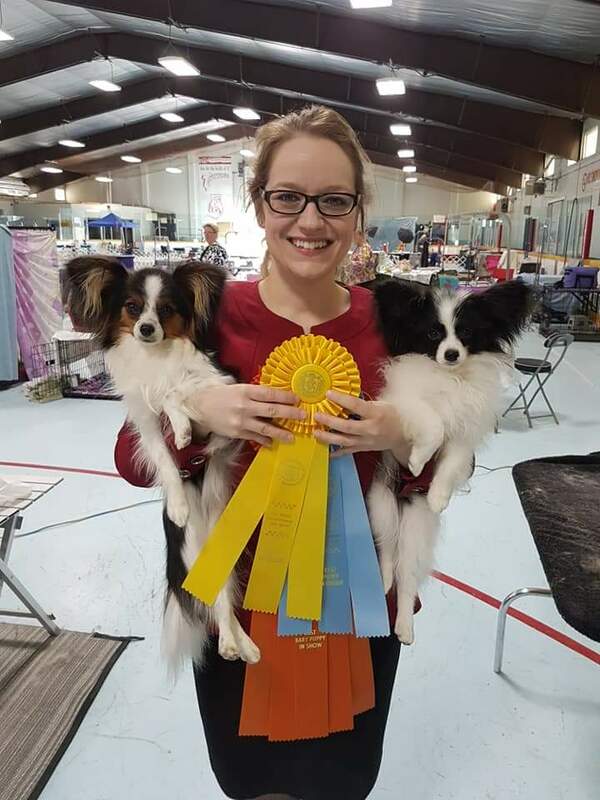 Southcreek’s Toast of the Town (Taylor) wins two group 4th and 3 more best puppy in groups at the Thunder Bay Kennel & Training Club show. Well done, Tay! May 2018 ~ Southcreek Papillons welcomed a beautiful litter of 4 puppies (3 boys, 1 girl) out of Phoebe and Noah! May 2018 ~ At the Lakehead Kennel Club dog show, Taylor finishes his Canadian championship with a group 2nd and group 3rd his second week out at only 9 months old! What a great weekend for such a young puppy! Baby Rosie, Southcreek’s Oulaw Della Rose, wins a best baby puppy in show! April 2018 ~ We traveled to the Assiniboine dog show in Mantioba with Taylor and Noah, where each boy picked up a few points. Taylor, Southcreek’s Toast of the Town, also picked up a few best puppy in groups! September 2017 ~ Noah is winners dog for his first point at the Thunder Bay Kennel and Training Club dog show on his 6th month birthday. August 2017 ~ Scout and Cooper welcome a beautiful litter of 4 puppies! July 2017 ~ We traveled to Portage la Prairie for the Papillon Canada National Specialty. 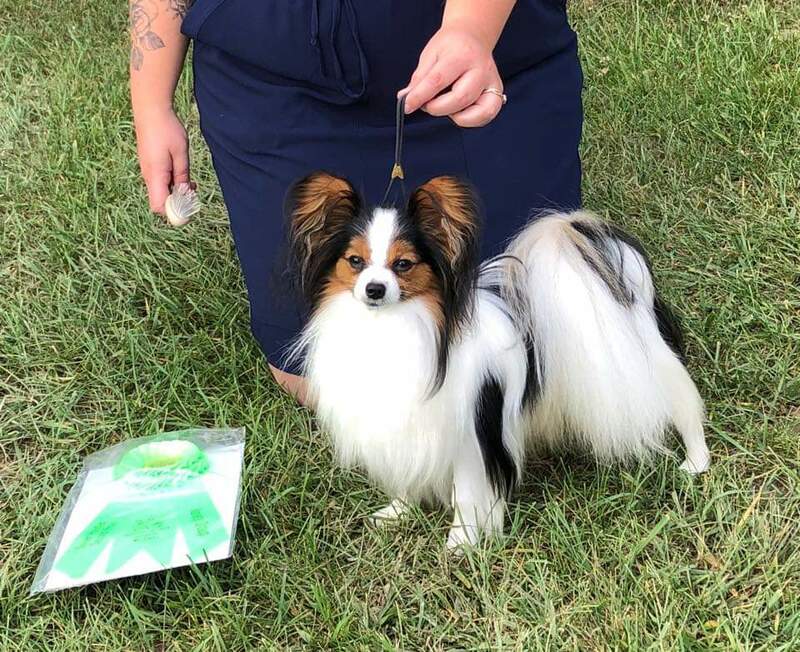 Our beautiful Myra was BOS at the National and won the breed at the Prairie Toy Specialty later that day, and on to win best in specialty show under Paula Hartinger! Thank you to the judges for these great honours and to Myra’s wonderful handler, Beth Chopey! June 2017 ~ Phoebe is a new champion! 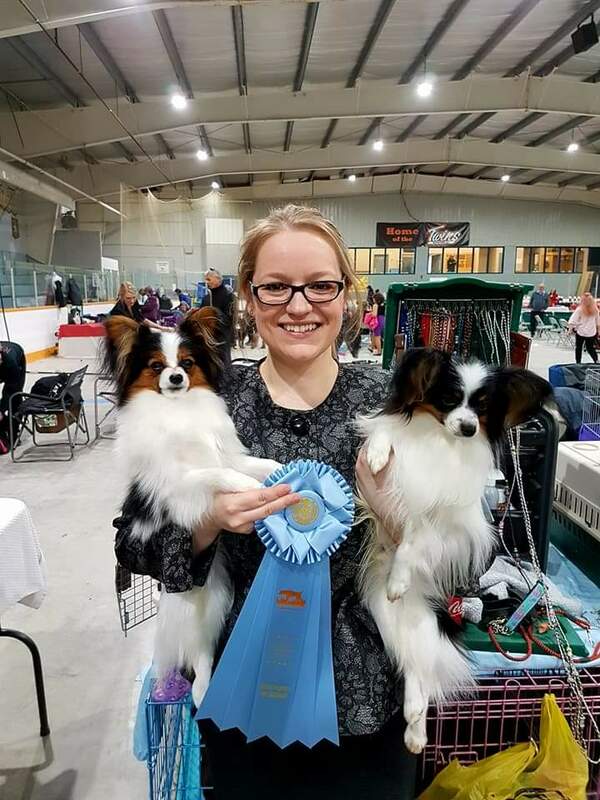 She finished at the Thunder Bay Kennel and Training Club dog show, and is now Ch. Southcreek’s Midnight Flyer! May 2017 ~ We had a great weekend at the Lakehead Kennel Club dog show! Little Phoebe picked up a few more points towards her Canadian championship, as well as a group 3rd and best bred by exhibitor in group! September 2016 ~ At the TBK&TC dog show, Phoebe, Southcreek’s Midnight Flyer, picked up her first points towards her Canadian championship as well as two best puppy in group wins! July 2016 ~ At the Lakehead Kennel Club dog show, Myra, Am/Can Ch Belcanto the Bandit Queen Belle Starr, received a group 3rd in a very competitive toy group. Baby Phoebe, Southcreek’s Midnight Flyer, received two best baby puppy in shows! June 2016 ~ We had an awesome weekend at the Thunder Bay Kennel & Training Club show with Myra! She finished her Canadian championship in one weekend with 1 group 1, 2 group 2s, and a group 4. Thank you to the judges! 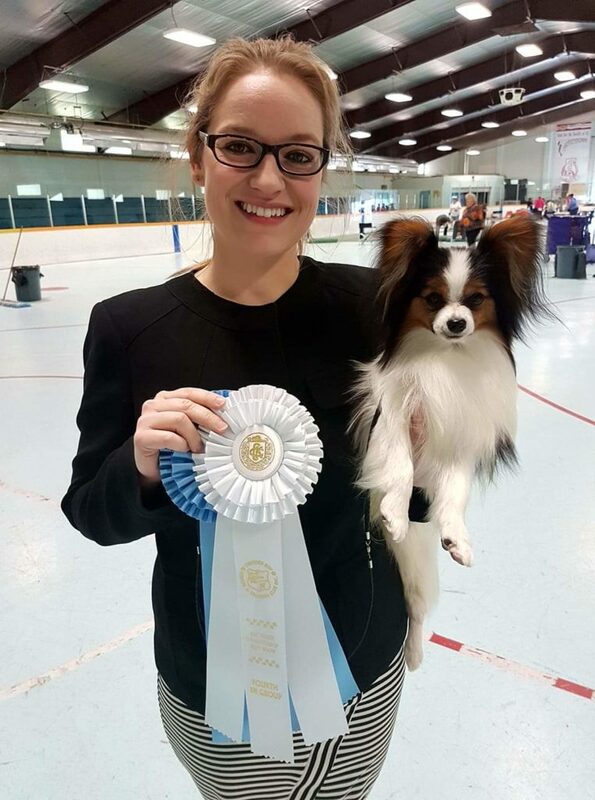 May 2016 ~ Cooper and Smudge have a great long weekend at the Sault Ste Marie Kennel Club dog show in a large Papillon entry! Both finish their Canadian championships and Cooper wins a group 3rd along the way. Thank you to the judges for recognizing our dogs! March 2016 ~ Southcreek Papillons is pleased to announce the arrival of 4 puppies (3 girls, 1 boy) on March 9! January 2016 ~ We are happy to announce the arrival of a singleton male puppy out of Jenner and Leah in December. He is the full brother to our Cooper. July 2015 ~ We had a great weekend at the Lakehead Kennel Club dog show! Cooper, Southcreek’s Lunatic Fringe, went group 3rd and best puppy in group! Baby Smudge, at less than 4 months, was best baby puppy in show! Thank you to the judges for recognizing these puppies! April 2015 ~ We are thrilled to announce the arrival of 5 puppies born April 6th out of Scout and Jenner! November 2014 ~ Southcreek Papillons is pleased to welcome a singleton male puppy! September 2014 ~ Jenner receives two group placements at the Thunder Bay Kennel and Training Club dog show. Thank you to the judges! July 25-27, 2014 ~ Scout, Ch. Zelicaon Breaking Bad at Southcreek, won a group fourth at the Lakehead Kennel Club dog show. Thank you to Judge Susan Norris-Jones. June 27-29, 2014 ~ We had another remarkable weekend at the Argus Kennel Club June show in Thunder Bay. Scout finished her championship in blazing style by winning the group! Our sincerest thanks to Judge Doris Willis for recognizing Scout. May 17-19, 2014 ~ We had a great long weekend at the Sault Ste. Marie Kennel Club dog show. Scout, Zelicaon Breaking Bad at Southcreek, was best of winners three times for 8 points towards her Canadian championship. She is off to a fantastic start! Jenner, Ch Zelicaon Take it to the Limit, was entered in two shows and came home with two best of breeds, several points towards his grand championship, and a group 4th. Thanks to all the judges! April 2014 ~ Southcreek Papillons is pleased to welcome a healthy little baby girl. Proud parents are Leah and Jenner. Pictured below is Leah and her baby at almost 4 weeks.